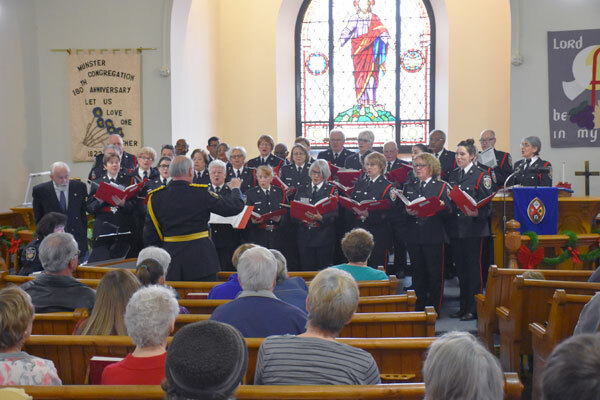 We were delighted to have the Ottawa Police Chorus perform at Munster United Church. It was early afternoon, Saturday 2 December 2017 and the setting was great. We enjoyed bright light streaming in through our huge stain glass window, providing plenty of backlight for the singers’ sheet music. It might have been a challenge for Chorus Director Geoff Linklater who was facing into it. Accompanist Carol Gurofsky and her page turner had no difficulty with the light in their eyes. The 30 voices launched into their performance with enthusiasm and the sound was delightful. The performance included the song “I’ve Been Everywhere” which was given a Canadian slant and turned into an action song. The song included dozens of Canadian city and town names. The singers each had several small signs with names and when the name came up in the song they held their sign high for a few seconds. It was quite a feat of coordination if you have ever sung and been required to perform an action at the right time. 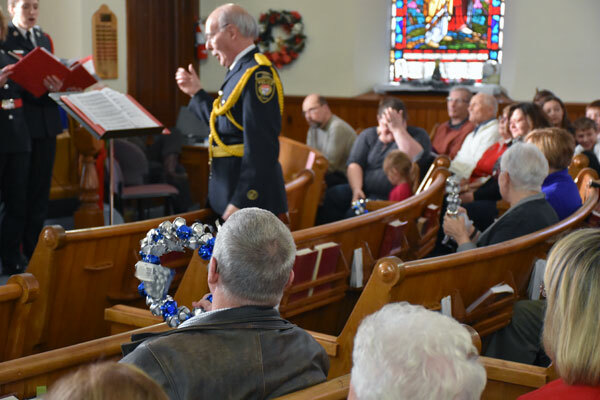 Considering we were in the season of Advent, leading to Christmas, the Ottawa Police Chorus included an audience participation song. The Director handed out several circular wreaths that included sleigh-like bells. The instruction was to ring them in time with the music when directed. Participants included a wide range of ages. 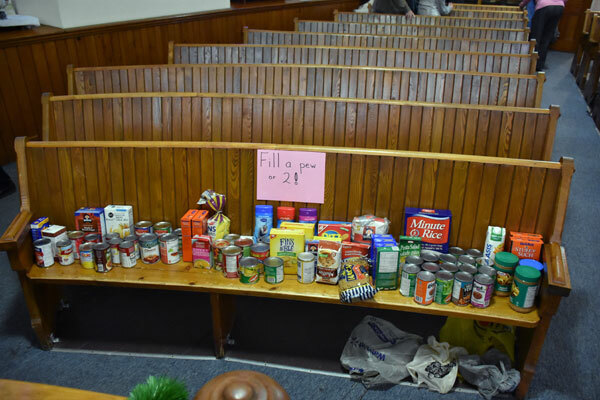 A joint objective of the Chorus and Munster United Church was the collection of items to be taken to the Food Bank. The members of the audience responded generously. The front pew of the church was filled. Members of the chorus and the church were proud to be helping others in need. At the conclusion of the last song, the audience gave the Chorus a well deserved standing ovation. Liz Hale who welcomed and introduced the Chorus also thanked them at the end, presented a cheque for their performance, and invited everyone downstairs for goodies, coffee, and tea. A number of people in the audience chatted with and complimented members of the Chorus. 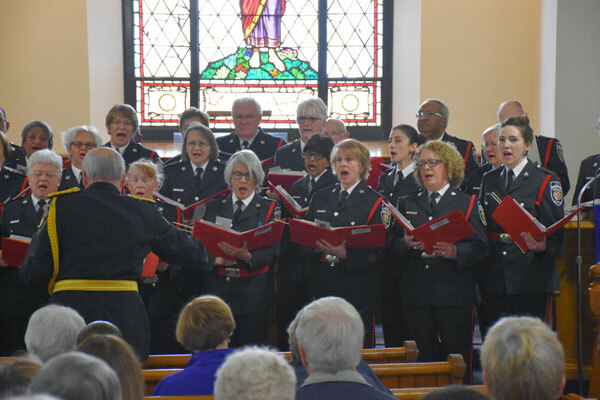 We express our gratitude to the Ottawa Police Chorus for coming to Munster United Church, entertaining our audience, and supporting our wish to help others in need. 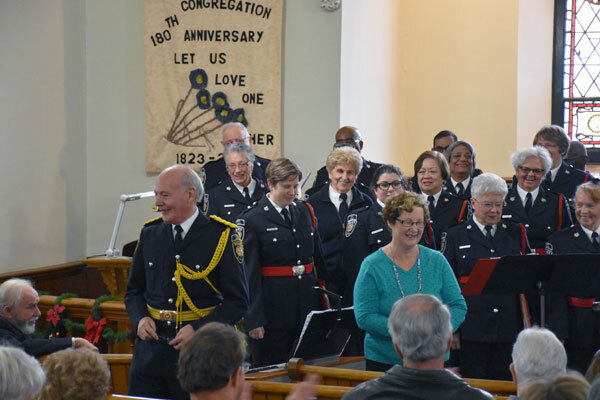 Liz Hale welcoming and introducing the Ottawa Police Chorus. 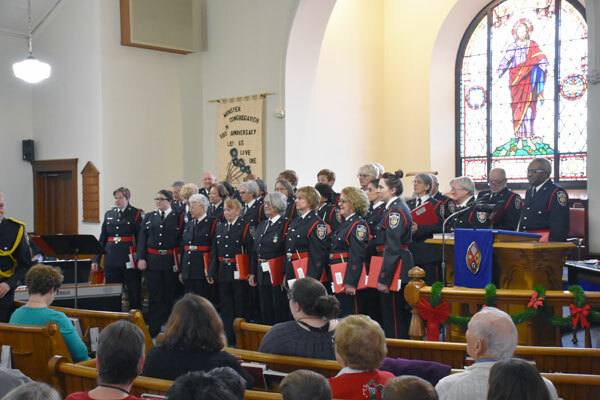 The Ottawa Police Chorus ready to start their performance of 2 December 2017. The start of the concert by the Ottawa Police Chorus. 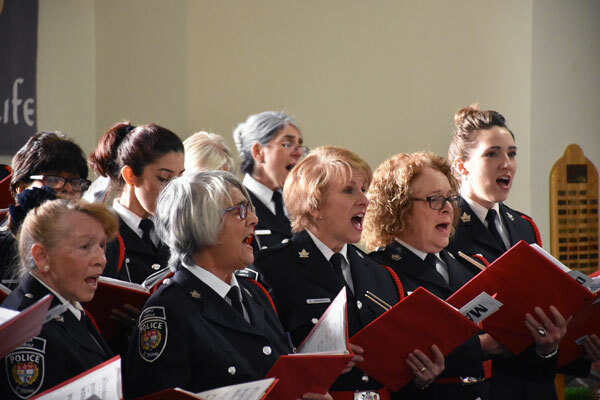 A close-up of some of the singers in the Ottawa Police Chorus. The finale of the song “I’ve Been Everywhere” with all the Canadian city and town names held high. Chorus Director Geoff Linklater working his magic. Singers demonstrating their enthusiasm and fine singing techniques. Chorus Director Geoff Linklater conducting the Chorus and ready to bring in the wreath bell ringers in the audience. 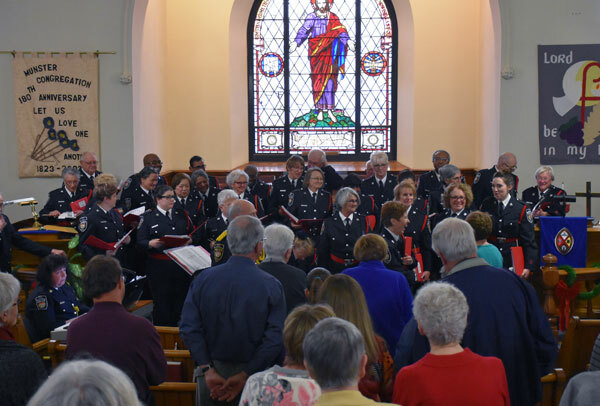 A standing ovation following a wonderful performance by the Ottawa Police Chorus. 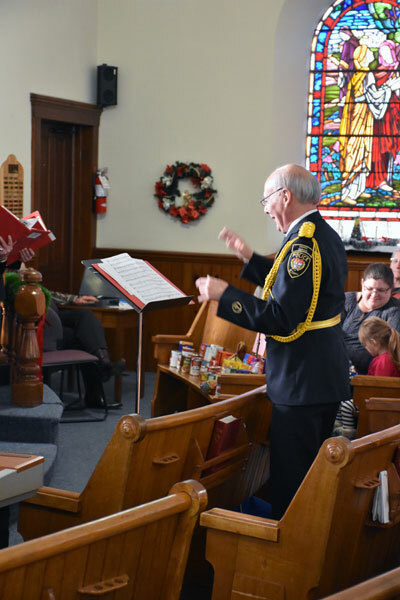 The people attending the Ottawa Police Chorus performance in Munster generously responded to support those in need with donations to the Food Bank.